In 1962 engineer and test flight pilot Neil Armstrong joins NASA as part of its second generation of astronauts, assigned to the Gemini and Apollo missions in the hopes of sending humans to the moon. As his work begins to consume his life, it places a growing strain on his relationship with his wife and family. Or something along those lines. Dry as the desert into which a younger Armstrong crashes an experimental aircraft, First Man is one of the most disappointing dramatic features of 2018. The first feature for director Damien Chazelle since his widely acclaimed musical La La Land, it takes one of the most inspiring moments of the 20th century and turns it into a drawn-out and maudlin chore. How does one make the Apollo moon landing miserable? The film opens with the death of a child, and never manages – or indeed attempts – to climb out of that pit. It jumps through a long period of time, following Armstrong from the air force to NASA, and Gemini to Apollo, without ever really pausing to give any other character much depth. Without fleshing them out, they simply become an interchangeable series of faceless bodies. Once they’re interchangeable, they’re impossible to care that much about. Unless you’re an Apollo program aficionado, you probably won’t even know their names. The only supporting character to get much attention at all is Claire Foy’s Janet Armstrong, presented her as a stereotypical chain-smoking and brittle wife. It is a waste of her talents. One would assume with so little focus on the supporting characters, that there would be an enormous amount of development for Neil Armstrong himself. Instead he remains a weirdly blank enigma, doing what he’s told by his superior officers but never actually showing off any drive or initiative himself. He does show off a single-minded desire to go to the moon, but once there (hopefully not a spoiler, it was a fairly major moment in history) there’s very little emotional payoff to make the preceding two hours worth the wait – just a sort of functional and glum misery. Ryan Gosling is a tremendous actor, but his best skill is in bring understated performances to his roles. When matched with a particularly internalised and stoic character, he seems almost inert. The historical accuracy, particularly minor background details, are impressively put together. Director of photography Linus Sandgren shoots the film with a particularly old-fashioned look too: thick with grain like a 1960s documentary. It is distracting at first, but it soon becomes familiar and oddly effective. Less successful is the choice to film each scene with a Paul Greengrass-style shaky handheld camera. It is active distracting throughout. This is Chazelle’s third film in a row about people’s ambition driving them beyond all common sense, and it’s a creative well that’s clearly running dry. 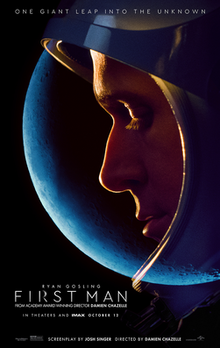 Simply put: First Man is a creative misfire. It assumes the audience already knows intimate details about the Apollo missions, and skips through history without pausing to ensure the viewers know who is who and what is happening. It willfully misses opportunities for moments of awe or warmth and gives little easy to engage or sympathise with the characters. There is enormous potential for a film about Neil Armstrong and the moon landing of Apollo 11. Chazelle has simply failed to find it. I’m glad I’m not the only one who was left a little cold by this.